This serene Nativity is carved from mahogany. 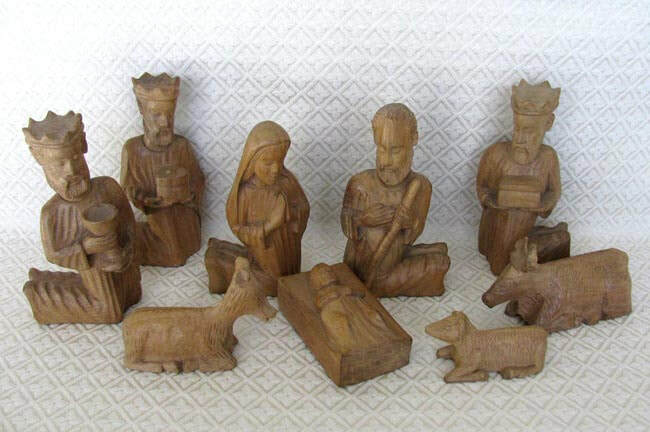 The set contains 9 figures: Joseph, Mary, baby Jesus in manger bed, a cow, a donkey, a sheep, and three wise men. Joseph measures 6.75 inches tall. The Nativity was carved by Joseph Saint Juste Carilien, a carver from Léogane, Haiti. Joseph was a featured artist on the National Mall in Washington, D.C. when the Smithsonian Institute presented its Folklife Festival in 2004 to commemorate the bicentennial of Haiti’s independence. This annual festival presents the diverse cultural heritage of the people of the United States and the world to large public audiences in an educational, respectful, and democratic way.